The text provides students with a unique learning experience—taking them on a journey through the origins and goals, key concepts, research development, and career options available in the field—in seven parts that may be studied in any sequence. Following an introduction to the field, the text then shifts focus to personal factors that affect performance and psychological development in sport, physical education, and exercise settings. Situational factors that influence behavior, group interaction and processes, and the use of psychological techniques to help people perform more effectively are covered, as well as the roles psychological factors play in health and exercise. The final section deals with topics of psychological development and well-being that are important to both society and sport and exercise psychology, including children’s psychological development through sport participation, aggression in sport, and moral development and good sporting behavior in sport and physical activity contexts. • Use actual sport and exercise psychology instruments to assess their skills. • Determine how to respond to real-life scenarios (with short answers or essays). • Review research studies and experiments. • Search the Internet for relevant information. • Apply and test their understanding of principles and concepts of sport and exercise psychology. Many of the study guide activities offer compelling audio and video clips that provide an interactive look at how sport psychology consultants communicate with athletes and coaches to improve athletic experiences. These clips feature esteemed experts from the field discussing course concepts that they have studied and refined during their professional careers. To further emphasize practical application, portfolio activities can be integrated through a full semester, turning course units into a unified whole that builds upon itself for greater understanding of the field. To aid instructors, instructor ancillaries have been updated and expanded. The instructor guide, test package, and presentation package are now supplemented with an image bank, gradable chapter quizzes, and instructor videos, all available at www.HumanKinetics.com/FoundationsOfSportAndExercisePsychology. 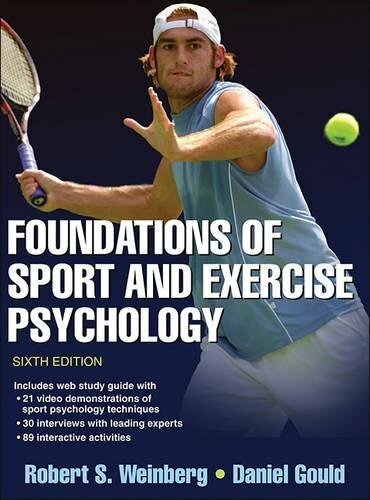 The updated sixth edition of Foundations of Sport and Exercise Psychology continues to ensure that students are well equipped to enter the field of sport psychology and are prepared for the challenges they may encounter as well as the possibilities. This text offers an enhanced and varied learning package to assist students in understanding the sport psychology field.